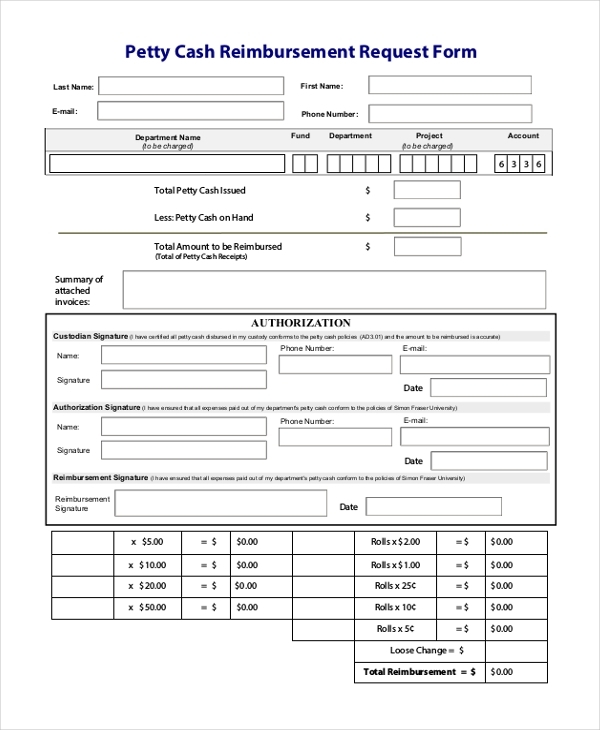 This form can be used by a contractor or a company employee to reclaim the money that they may have spent while carrying out the job requested by the hiring party or an organization. As the name suggests, this form is used by a party to request the custodian of the petty cash to clear the outstanding amount for the expenses that the party may have rendered on various occasions while working for the custodian. 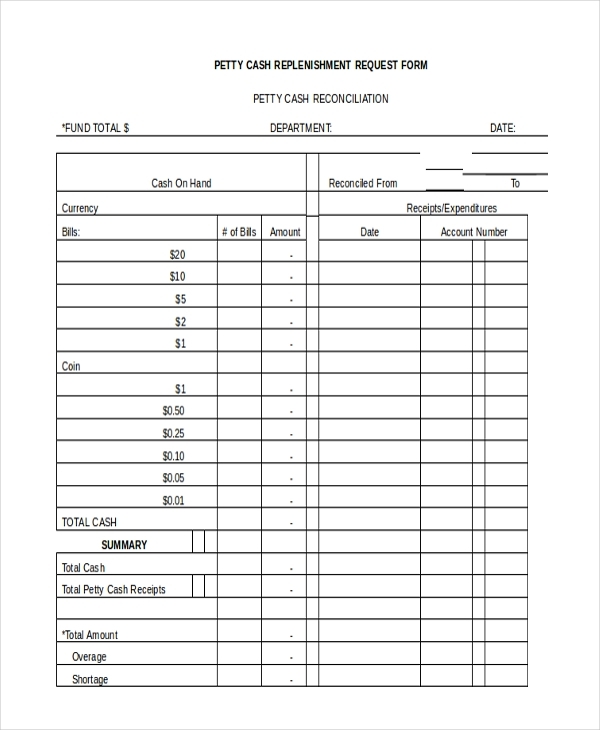 When a party expects the cash to be directly reimbursed by the cashier of an organization, they are expected to fill this form and then submit it to the cashier. Once the cashier’s office reviews the form and finds it satisfactory, they go ahead and make the payment. When the custodian of the petty cash runs out of funds and needs more money to carry out further transactions, he or she fills up a petty cash replenishment request form and submits it to their higher official. The custodian of the petty cash is required to report the details of the petty cash settlement made over a certain period of time such that the cash can be replenished. Using a petty cash reconciliation and replenishment form helps him to provide the higher official with the details and request more cash. 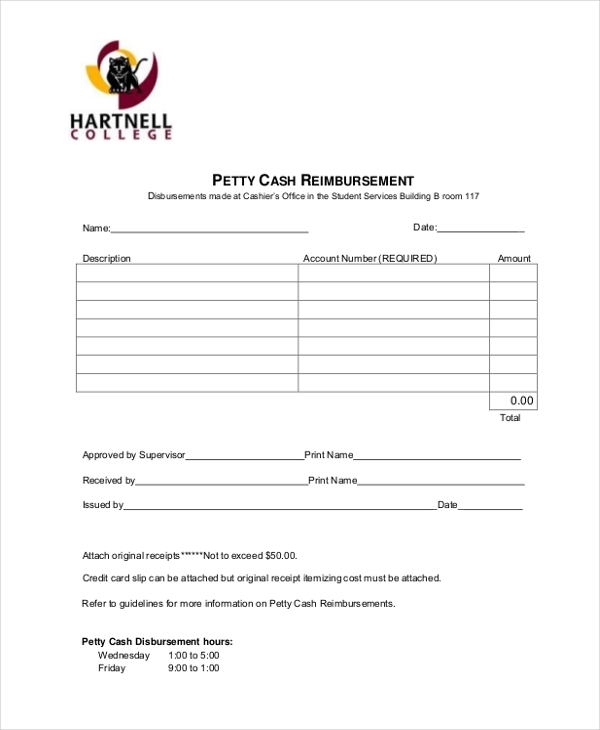 As the name suggests, this is a petty cash reimbursement form that is used by the teachers and other employees of a college to request a reimbursement for the expenses rendered by them during an event or occasion. This form is used by the employees of a university to request for an advance on or reimbursement for the expenses rendered by them on any given occasion. By submitting this form to the custodian, they can get the required cash. By using a petty cash reimbursement form, a person can request the other party to replace the money that they may have spent while carrying out a job for the party concerned. It is mainly used at places of work. When an employee renders expenses for the company or organization to organize an event or to travel to a place, he uses this form to get the cash reimbursed. This form is used by the contractors to request a reimbursement of the money that they may have spent for minor things while carrying out a work for the hirer. 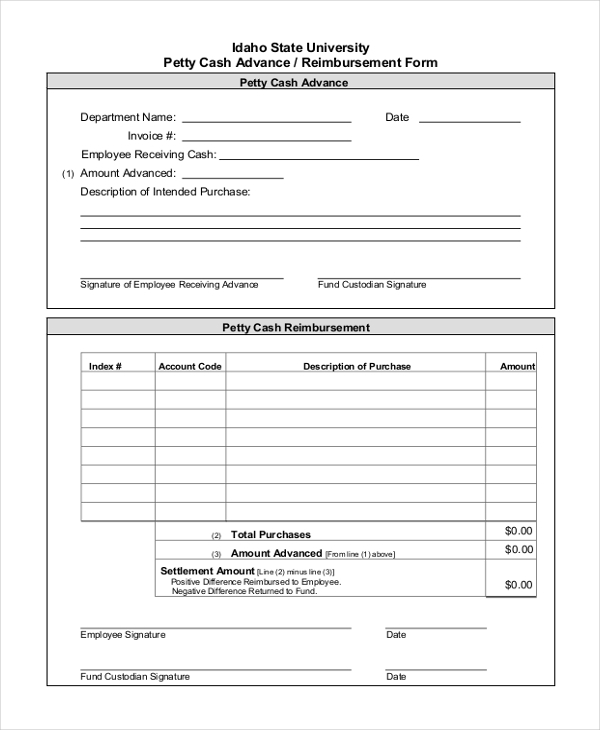 The custodians of petty cash use these forms to report the amount of money reimbursed and to request for replenishment of cash. 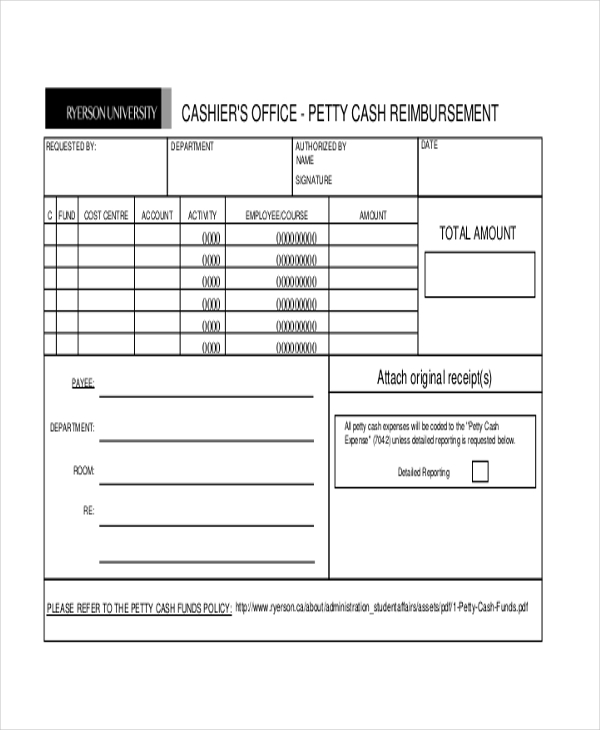 Why Use Petty Cash Reimbursement Form? As an employee of an organization or a contractor offering his services to a party, there might be times when you may have to put in some money from your pocket to get things done. However, the organization or the person concerned should return this money to you. By using a petty cash reimbursement form, you can request this amount to be reimbursed to you. If course, you should also present the bills of the expenses rendered for review along with the form. What are Benefits of Using Petty Cash Reimbursement Form? How to Design a Petty Cash Reimbursement Form? 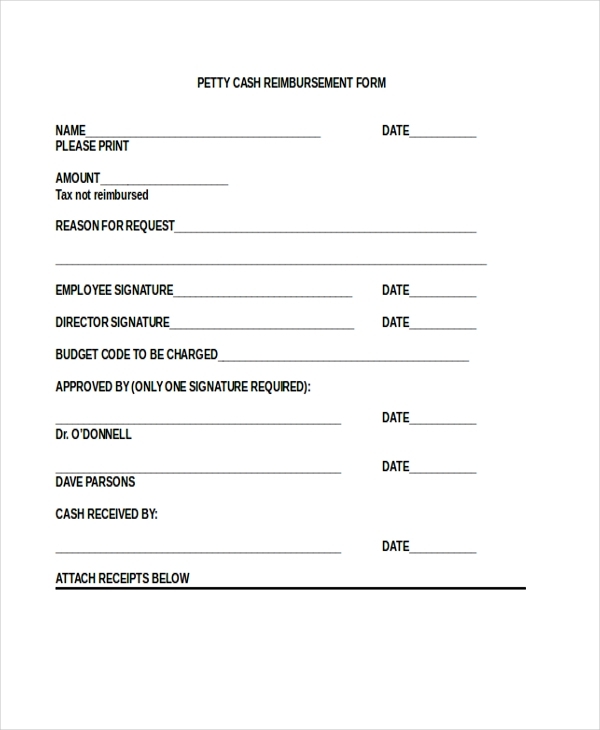 Petty cash reimbursement form can come in handy for both the person requesting the reimbursement as well as the custodian of the cash. However, if designing this seems to be a task, it can now easily be downloaded as these forms are now readily available online. All you need to do is download one and personalize it.